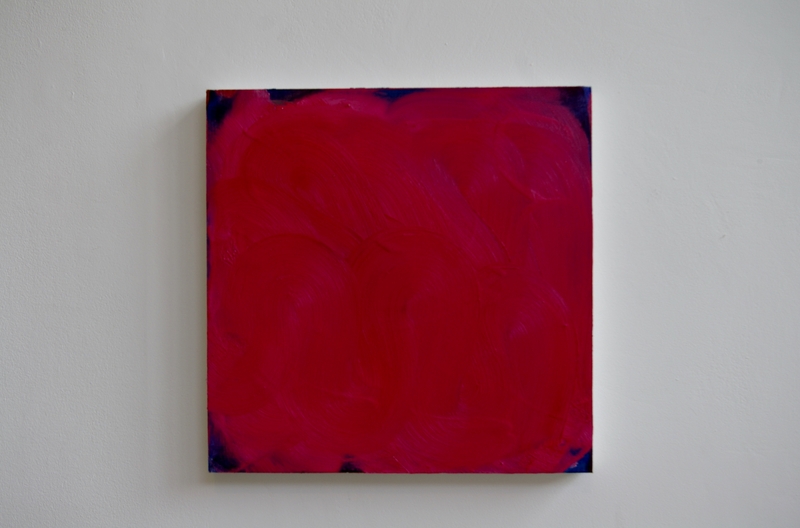 About Painting at Castlefield Gallery, Manchester, curated by Lisa Denyer, is an exploration of contemporary abstract painting, featuring eight artists including me. I hope it’s acceptable to review an exhibition in which I am a participant. The artists are : Claudia Böese, Louisa Chambers, Lisa Denyer, Terry Greene, Matthew Macaulay, David Manley, Andy Parkinson and Anne Parkinson (no relation). It is an honour to be associated with this group. Window of Castlefield Gallery with my own painting “cover” on the wall below. The gallery, which is this year celebrating it’s thirtieth year, looks out onto Castlefield and Deansgate rail and metro stops. Today at the opening, on such a warm and sunny evening the place has something of a continental feel to it. The colours of some of the paintings, warm hues against a pristine white backdrop, add to this sensation. In the upper gallery, works by Terry Greene, Anne Parkinson and Louisa Chambers kick off the show, and already what I am noticing is the variety of approaches. Greene’s paintings are intuitively arrived at, through a process of trial and error, in a context in which it is difficult to define what an “error” might be. In a way it’s painting as problem-solving, as opposed to puzzle-deciphering, where I am thinking of problems as having multiple correct answers and puzzles as having just the one correct answer. And whilst this could perhaps be said of all painting, for me, Greene’s work gives particular emphasis to this aspect of the medium. Colour/shapes are added and responded to and then, according to some internal logic, some are wiped away with a cloth and then something different laid down in their place. The residue of previous configurations shows through the final arrangement. It would be an overstatement to say that the painting makes itself, along the lines of a self-organising system, but I bet it feels that way to the artist, proceeding by continually asking the painting what it wants to become. Neighbouring Grounds wanted to become a ground only, surrounded by other grounds that might also be standing two dimensional figures gathered around a portal when the central area is an absence. When the central area becomes a positive shape then I can divide the action in half diagonally from top right to bottom left, the other shapes joining together to form a warped frame with the three shapes touching the top and left edge receding in space whilst the shapes along the bottom edge and right hand side push forward. Three shapes opposing three others forming an irregular hexagon in the centre. In Anne Parkinson’s approach to painting most of the decision making takes place before the paint is laid down. A system is described according to particular rules, though I am unsure whether I am working them out correctly, perhaps due to the multiple ways we have available to us of classifying our experience. 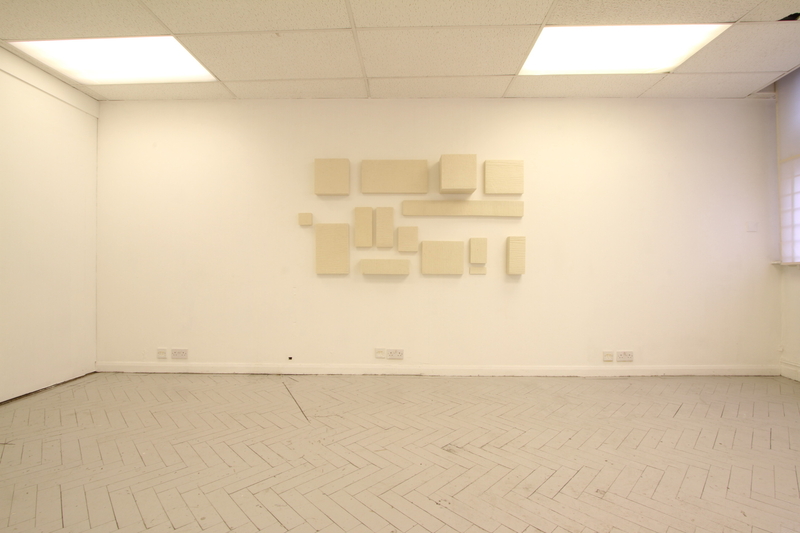 In Expansion, nine paintings on unstretched canvases are pinned to the wall in a grid formation, I see a row of three rectangles above a row of four rectangles, above a row of two rectangles, but my brain fills in the ‘blanks’ to find three rows or four with spaces. 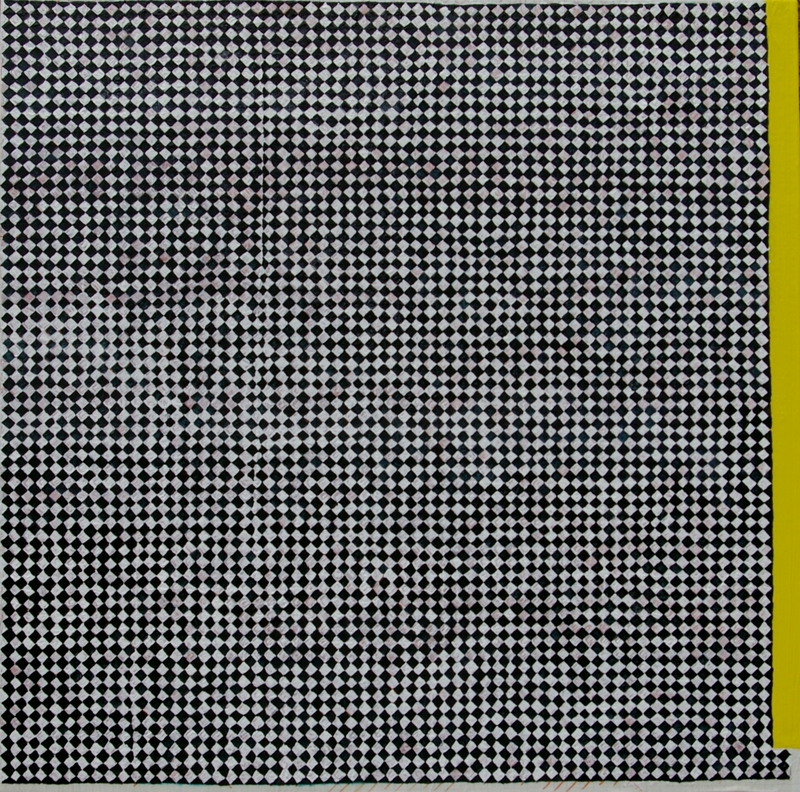 Each individual painting similarly has three rows of four rectangles, that could be read as single brush strokes, with units missing, no one arrangement ever repeated. 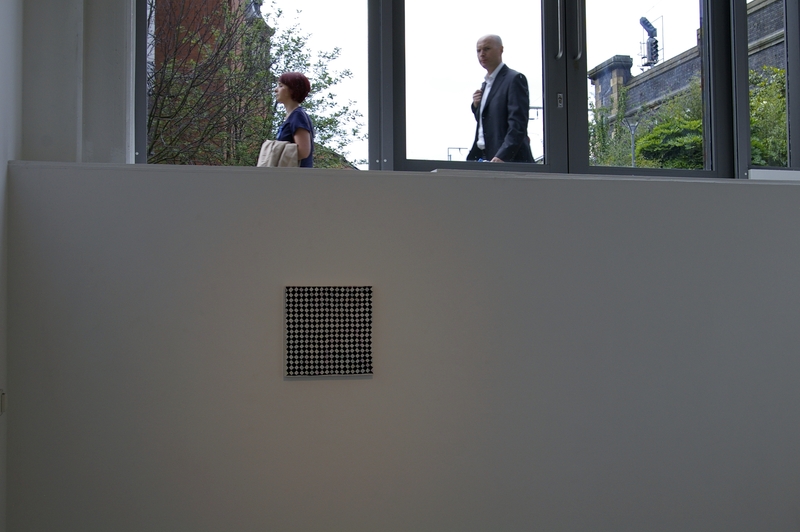 On the top row, one of the paintings is simply a black monochrome rectangle, yet I cannot help but read it as an ’empty’ grid now that I have become conditioned to see the grid format. I am recalling Boolean algebra, or digital information theory, where either a 0 or a 1 is the carrier of ‘meaning’. Yet the colour and subtle irregularity of paint handling is decidedly analogue. If this analogue/digital contrast could be stretched to suggests a theme of something akin to “Technology vs Primitivism” I could claim to find this theme running throughout all modern and contemporary art and certainly it would be a way of codifying the paintings in this show. I feel sure this dichotomy is actually present in the paintings by Louisa Chambers, though I acknowledge my propensity to over-interpret. 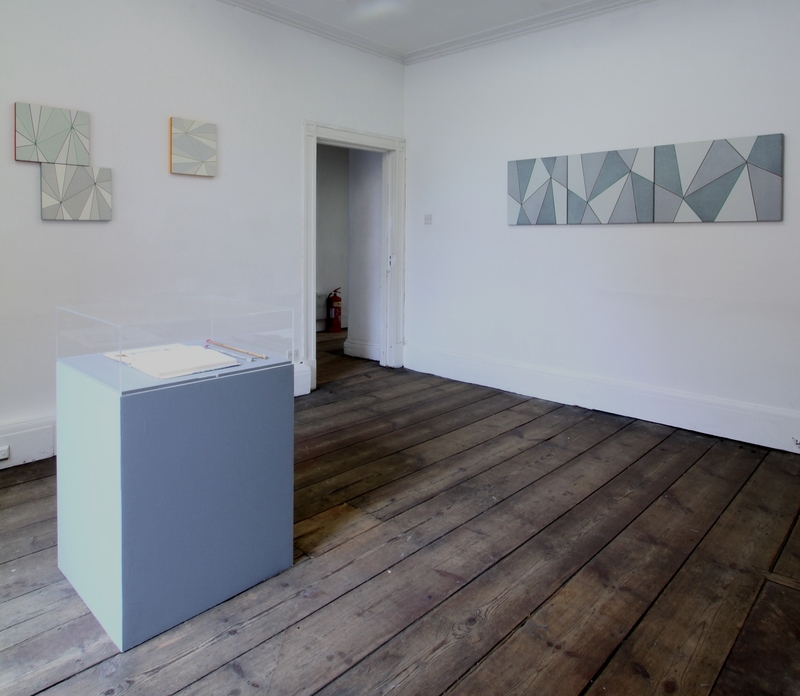 There are four wonderful paintings by Chambers here, two from her Flatland series, one from her Rotation series and one from her Two-Foldness series. I love her use of colour and the way the images shift and create multiple readings, only one of which can be held at any one time, creating a sense of movement as well as a shifting of space within an essentially two-dimensional framework. Patterns are established and then interrupted, and figuration is suggested and then suspended in a continuous loop. The images have a cartoon like appearance, reminding me at times of TV graphics, and when I find figuration it is often technology or machinery in a landscape that comes to my mind. Issues of playfulness (and its difficulty) within a technologically determined world seem at least alluded to. If in my viewing of Chambers’ paintings today it is image that I am most aware of, in David Manley’s and Lisa Denyers paintings I am reminded that a painting is also an object. In Manley’s delightful small canvases here, he explores a theme based on a proscenium arch that he first began using many years ago, and to which he has recently returned. The colours are inspired by light and colour of Cornish coastal villages, beaches and coves and the scale is small, miniature even, so that what their presentation as beautiful objects is what I see first, the fact that some of these tiny canvases are painted all the way around the sides increases my perception of them as things, also noting that the colours look particularly vibrant along the top, recalling the experience I often have when working on a painting horizontally, the amazing colour I see when the work is flat dissipates the moment I lift the work to view it vertically on the wall. Manley has maintained this colour vitality by continuing the painting around the edges and especially along the top. 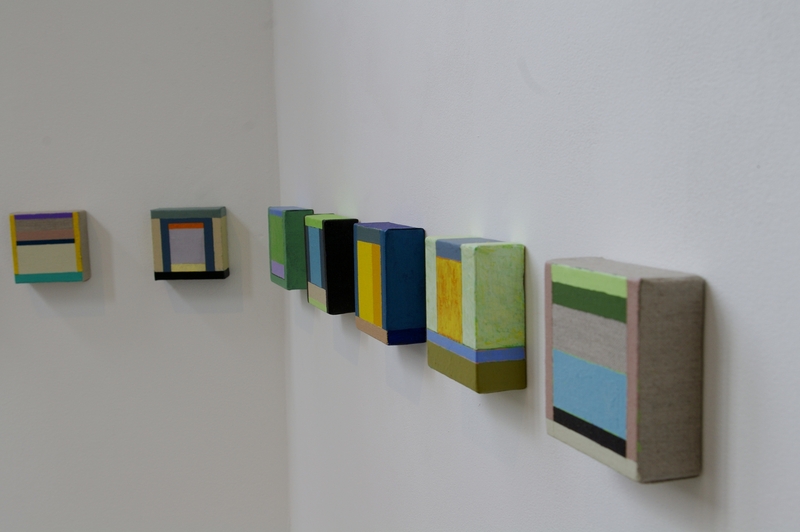 Denyer’s paintings on stone are quite evidently objects. In these three dimensional paintings she brings attention to the stone rather than simply decorating it. There is an element of adding something that wasn’t there before, especially in the colours she uses, and there is a definite process of ‘doing something’ to the stone, but I am put more strongly in remembrance of Michelangelo’s strategy in relation to his Prisoner sculptures, where he claimed to draw the forms from within the rock rather than imposing them from without. In bringing my attention to the stones I notice that they are not at all in their natural state, they have already gone through a lengthy process of being quarried, built and demolished. If moments ago, I was thinking in terms of the opposition of digital vs analogue, extended to technological vs primitive, I am now thinking about the natural vs the artificial, which might actually be a subset of the other opposition already referred to. 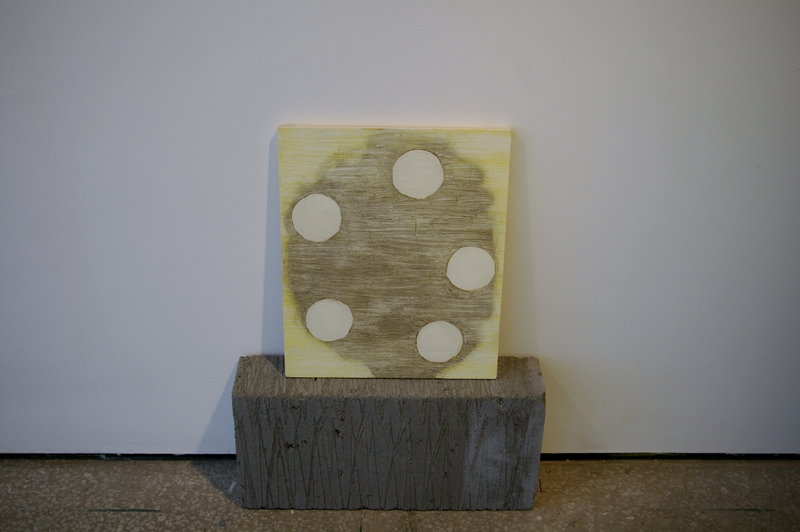 In Denyer’s two dimensional paintings I am once again impressed by the refinement of the carefully made object, as well as by the textures of the surface when she uses found plywood. I think I have said before that I find both affirmation-and-denial of materiality going on here. 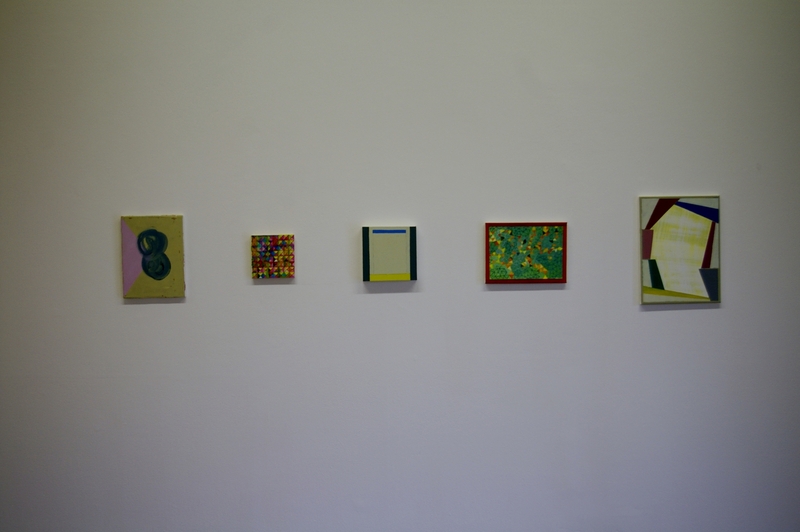 I like that in her curation of this exhibition, Denyer has chosen to display the work in interesting ways. 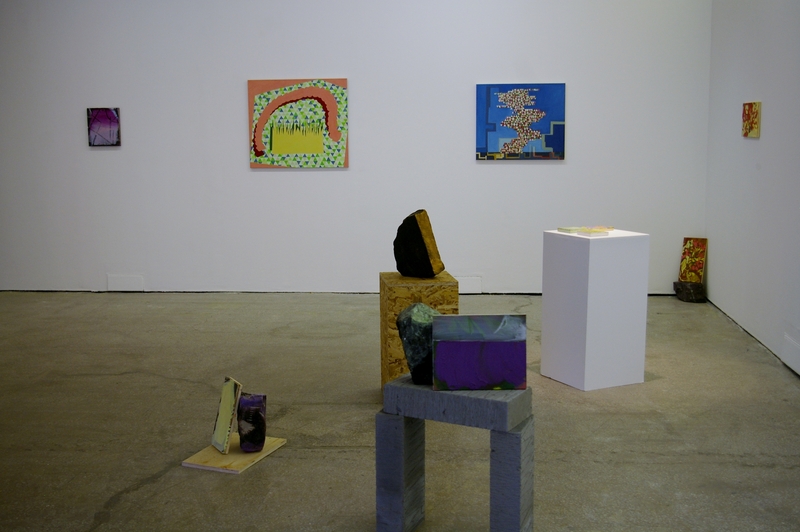 Some of her own paintings as well as some of Claudia Böese’ and one of Matthew Macaulay’s are propped against stones or displayed on plinths, emphasising their materiality. I am also very impressed by the way she has lit my own paintings so that the surface detail that is so difficult to show in a photograph, becomes easier to see. The charming paintings by Böese here, are varied in style, some are “hard-nosed” abstraction exploring process in grid like arrangements whereas others approach figuration, based on Chaïm Soutine‘s paintings of flowers, often it’s frames and edges that she seems interested in. I sense that this links to metaphorical ‘content’ both about painting and about the psychological experience of feeling “on the edge” of something. Matthew Macaulay’s paintings seem to have taken a near-monochrome turn as haptic mark-making and resultant images are unified using a larger swirling gesture, recalling the act of “whitening out” that builders or shopfitters might use on a large window or a vacant storefront. The gesture at once connects to a painting that is urban, vernacular, and largely unconscious. At the same time the colours he employs seem far removed from whitening. In this wonderful painting Living in a Daydream for example the overall red glows with an assertive energy. Its energy is all vision and image, whereas its gesture is more texture and material. In my own systems oriented paintings, I may appear to be doing the opposite of Macaulay, who’s affirmation of colour and energy I might even be attempting to obliterate as I cover fluorescent coloured designs with a diagonally oriented chequer pattern. Actually, it’s what remains after this process that interests me, the way that colours show through, as well as, and perhaps more importantly, the way that when faced with a black and white pattern, and taking time to look, we involuntarily invent colours of our own. 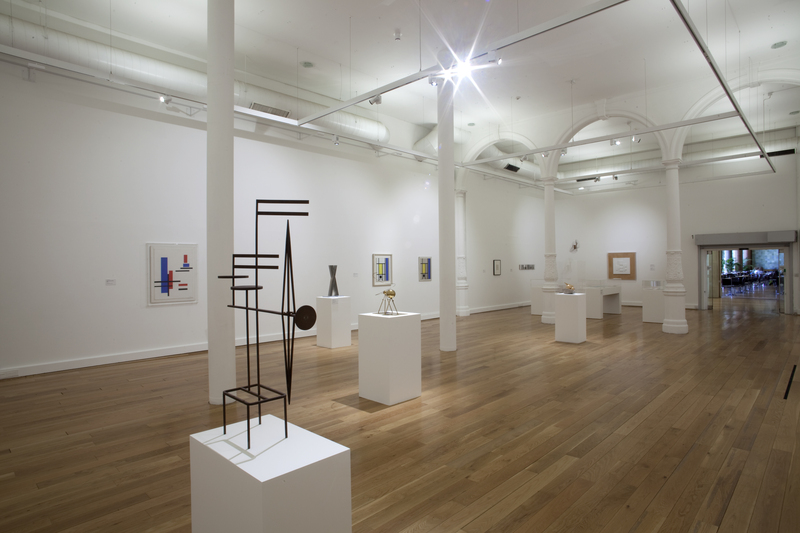 About Painting is at Castlefield Gallery until 29 June 2014. 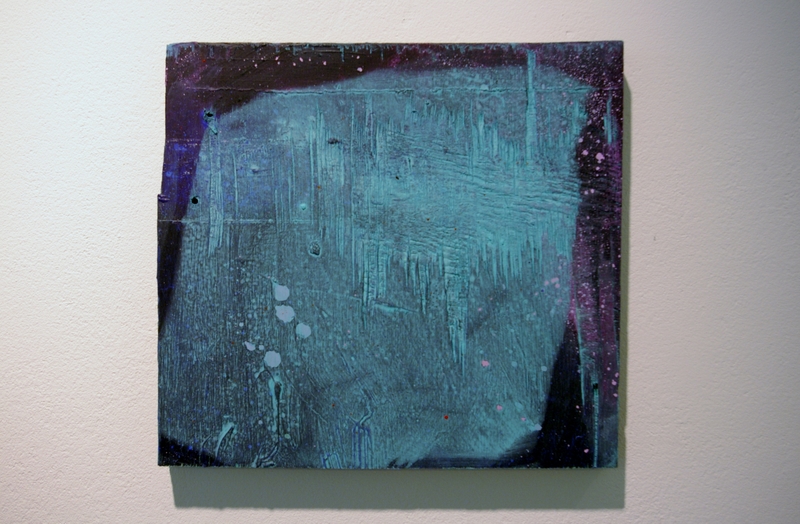 Evidence of a systems based process can be found in Andy Parkinson’s paintings. 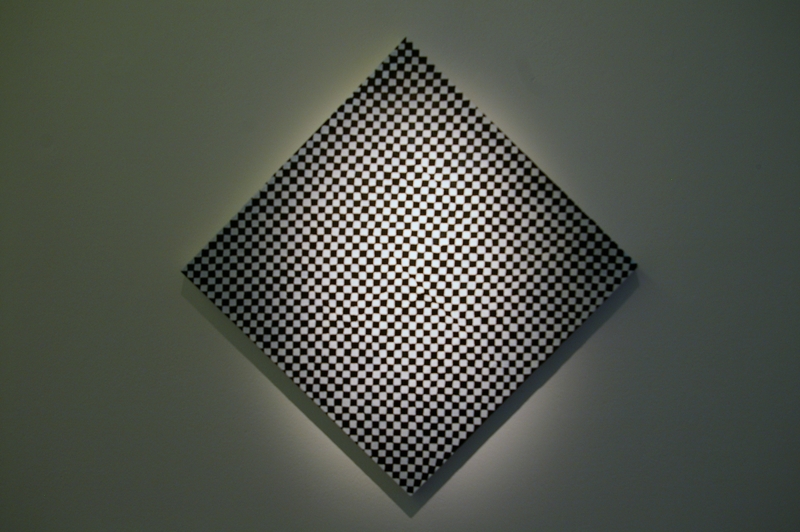 The checkered overlay has been adhered to a florescent ground, all but blocking out the underlying hues. However on closer inspection, vague forms and subtle colours come through from underneath. The optical illusion brought about by the contrasting black and white checkering creates the appearance of more colour in turn. 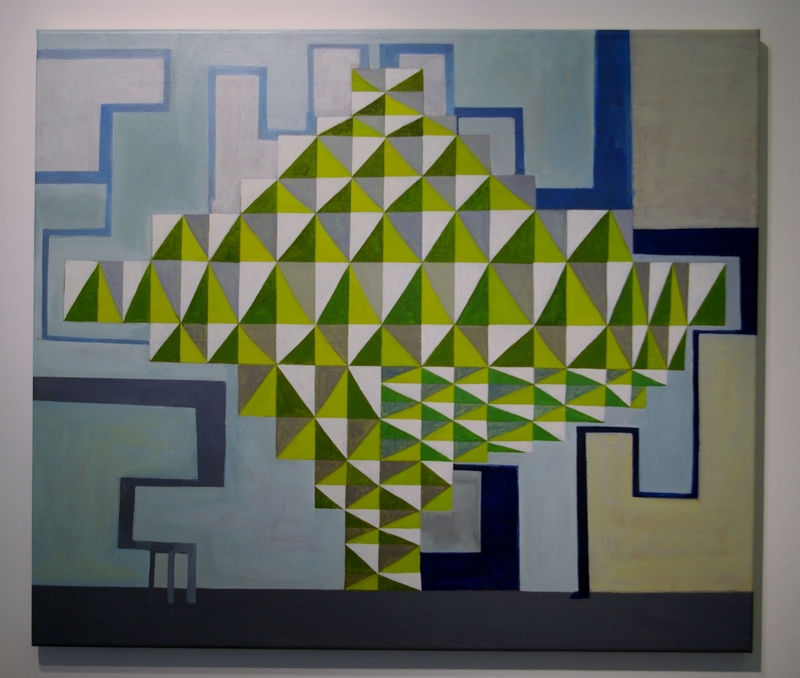 A similar repetition of motif is utilized in the work of Louisa Chambers. There is a sense of fairground and fantastical landscape in her vividly coloured paintings; it’s not surprising that contemplation of alternative universes has been instrumental in the making of these pieces. Imagery in the work references castles, monarchy, and the futuristic. These paintings bring to mind a kind of strange, robotic fairy tale. 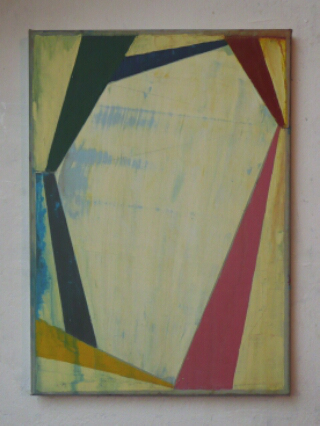 David Manley’s intimate paintings are representative of a relatively new way of working in contemporary abstraction. Their miniature scale and clean simplicity invites closer inspection. They are the result of investigations into fundamental form and restricted colour, inspired by place, structure and an architectural interest, with particular reference to the proscenium arch. 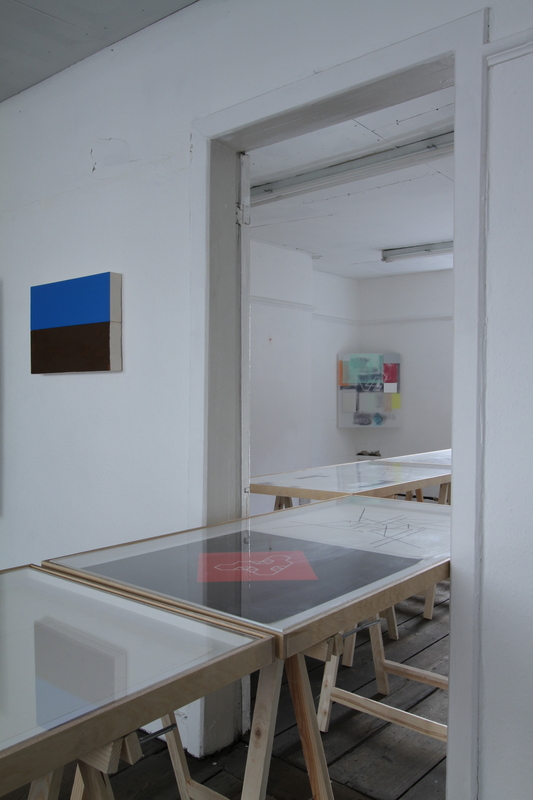 The works on display by Anne Parkinson centre around pre-planned systems, and experiments in the properties of colour. There is an emphasis on polarity of hue, allowing a visual complexity to manifest when pared with simple mark making. The paintings were made to be shown together, so although each component is small in scale, the repetition in their display creates an impactful and responsive visual series. The paintings of Claudia Böse show careful thought and process-led considerations around form in her exploration of the medium. Böse focusses on contained areas created by framing devices, inspired by the domestic and every day life; screens, table mats, and windows amongst others. These paintings incorporate influences from place, history and nature, creating a new interpretation of these ideas through an abstract language. 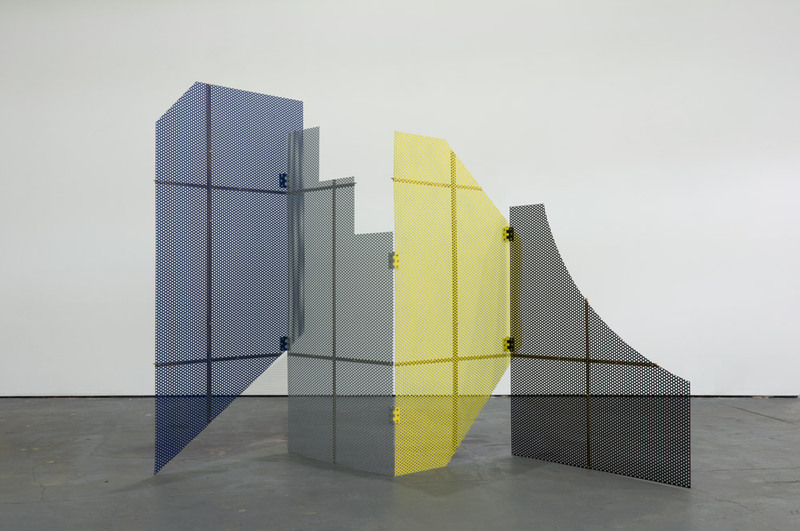 Matthew Macaulay’s playful use of paint is reflected in the titles of his work. An exciting energy is conveyed in his gestural brush stokes and mark making. Macaulay’s work is simple whilst being nuanced. His paintings celebrate colour and imbue a sense of impact, drawing on influences from art history, and reflecting his own experiences to produce something new and joyful. 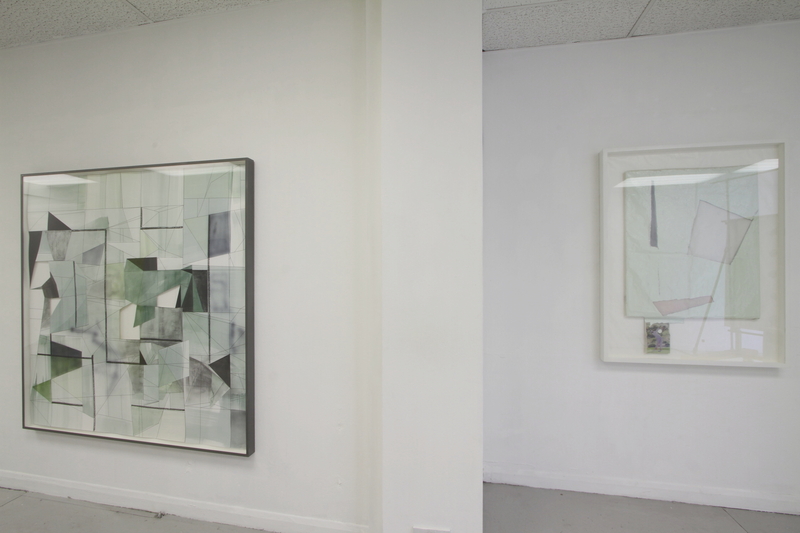 Experimentation and risk taking are evident in the work of Terry Greene. However, careful consideration of form and structure is equally apparent. Traces of the painting process reveal themselves in the multitude of layers that can be discerned in different aspects of these pieces. Investigation, and a full exploration of the medium have occurred here before arriving at a tension that feels right. 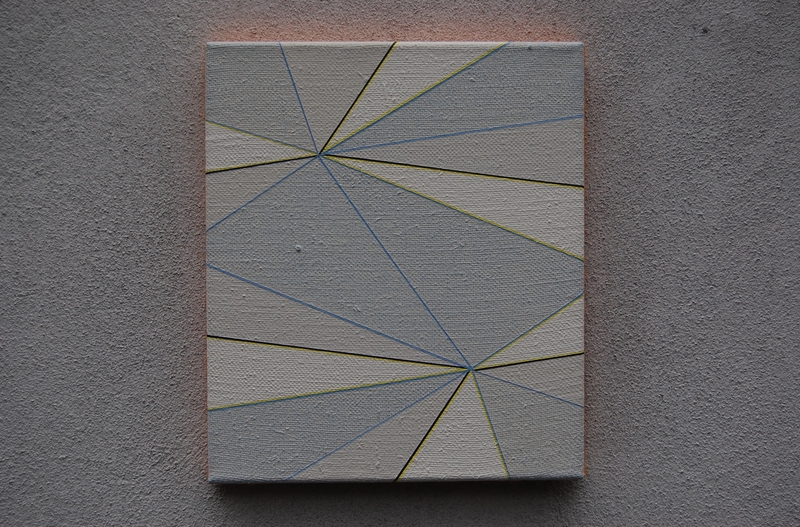 Lisa Denyer’s paintings show a strong interest in materiality. The found plywood she chooses as support adds compositional details in the grain and irregularities of the surface. 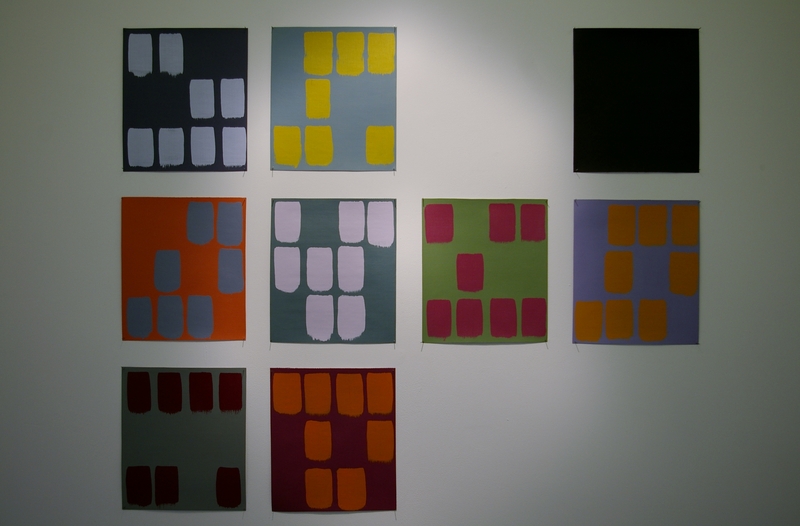 Simple shape, excavation and subsequent covering of colour are prevalent themes in Denyer’s work. Residual landscape associations are apparent, as well as references to architectural structures and cosmological depiction. 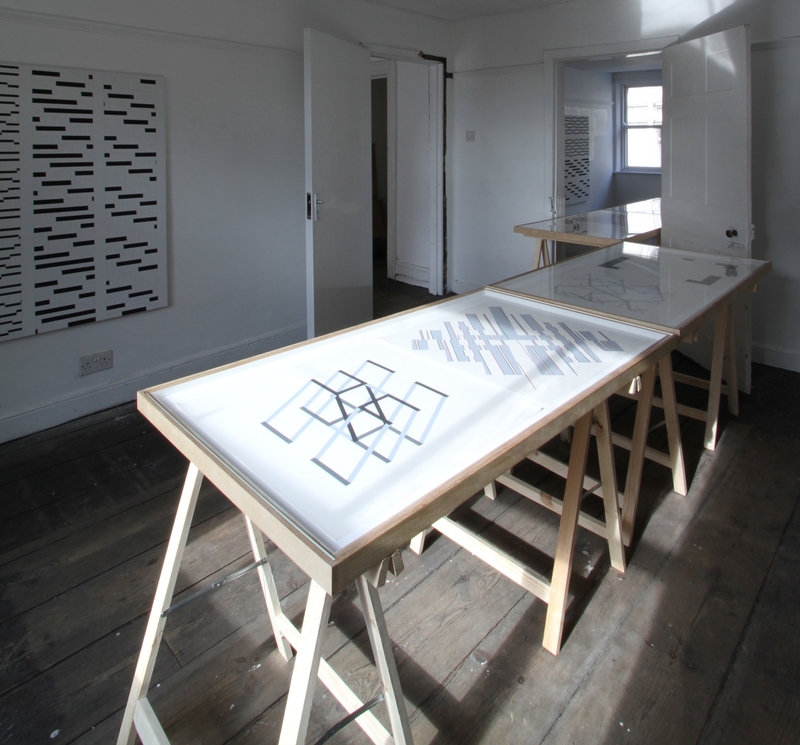 Claudia Böse, Louisa Chambers, Lisa Denyer, Terry Greene, Matthew Macaulay, David Manley, Andy Parkinson, Anne Parkinson. 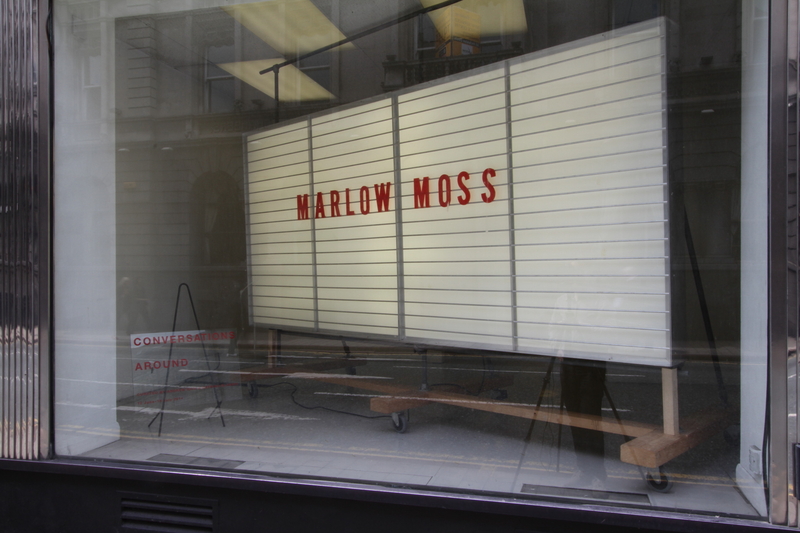 Preview Thursday 19 June, 6 – 9 PM. All Welcome!